Polhemus, the industry leader in 6 Degree of Freedom (6 DOF) motion capture, tracking, and digitizing technologies is proud to announce PATRIOT, the new dual sensor, 6 DOF tracking product. PATRIOT represents a quantum leap in new technology with a speed of 60 Hz per sensor, ease of use via an intuitive Graphical User Interface (GUI), and improved signal-to-noise ratios which increase stability and resolution while providing consistent high quality data. 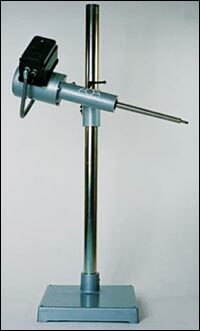 In addition, the size of the electronics unit is only 6.75 inches L x 6.24 inches W x 1.75 inches H. Costing only $2500, PATRIOT is ideal for head tracking, biomechanical analysis, computer graphics, cursor control, and stereotaxic localization. 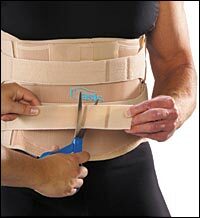 OPTEC Inc. announces the Improved Oasis" LSO & TLSO Soft Spinal System. The new cut-to-size closure system offers maximum support and stabilization, providing anterior/posterior compression and limiting unwanted motion. Realastic's silicone products are made with a proprietary formula that produces an extremely durable skin--much more durable than traditional RTV silicones. Available in 24 colors and sizes from infant to adult, prices range from $175 for the RealFlex glove to $645 for a custom partial foot. "We aren't dealing in coatings with our silicone products -- this is a 100% silicone high definition look," says Realastic's Dewey Yeargin. To browse Realastic products, visit their web site. 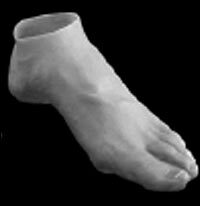 Ongoing Care Solutions offers a complete line of orthotics including Ankle Foot Orthotics (AFOs) from only $31.95! 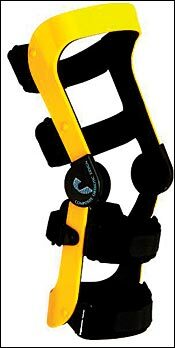 Visit www.ongoingcare.com to view these AFOs and our complete, exceptional product line. Ohio Willow Wood Asks: What’s Your Style of Comfort? No matter what your lifestyle, Ohio Willow Wood has an Alpha® Liner to suit your needs. Our new Alpha MAX Liner offers a custom-made fabric that provides active patients with a maximum level of comfort. The unique feature of the Stabilizing Strip combined with the Alpha MAX fabric, reduces movement and gel delamination, creating a strong interface that is three times more durable than many. Improved performance at Alpha Liner original prices means practical alternatives when you and your prosthetist choose the style of comfort. Join HMS on the “Fast Track” to Success! Healthcare Marketing Services (HMS) has a successful track record in marketing and securing managed care, PPO, W/C, and hospital inpatient contracts for orthotic and prosthetic companies. HMS also works on establishing relationships with physicians and physical therapists within your service area. Why not give HMS a call? With HMS working for you, you can concentrate on the other aspects of your business and feel confident that you are on your way to success! The TRS BAHA, an advancement in body-powered harness design which improves biomechanics by optimizing the harness axilla angle and creating a more efficient cable control pathway, is available now! 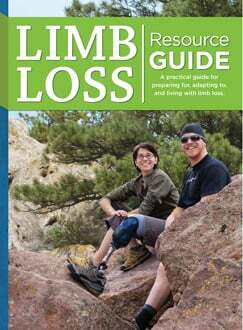 Satisfy your upper-extremity amputee patients' needs with TRS BAHA! Silipos Inc. announces the launch of its new, improved Silosheath. For use by BK amputees to cushion and protect, the Silipos gel inside Silosheath incorporates medical-grade mineral oil that gradually diffuses onto the skin reducing friction and pressure, improving skin elasticity, and minimizing scarring. 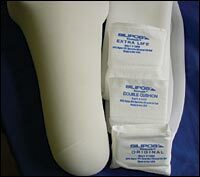 The new, improved Silosheath offers amputees better stretch, improved durability, a flat seam, greater shear protection, and is also excellent for skin graft patients. Berretta Medical Inc. (BMI) manufactures a complete line of custom and off-the-shelf orthopedic knee braces with the function and cosmetics to please your patients. All BMI products are manufactured to the highest standards using superior quality materials. BMI offers exceptional customer service with super-fast delivery and invites you to visit their website for knee brace and full product line details. Ossur has unveiled its Iceross Seal-In Liner. Featuring a Hypobaric Sealing Membrane (HSM"), a device bonded to the wall of the liner which conforms to the shape of the internal socket wall, the liner is ideal for lower-limb amputees seeking comfort and secure suspension. When the Iceross Seal-In Liner is donned and the socket stepped into, air expels through a distal valve creating hypobaric suction. Ossur's proprietary stabilizing matrix supports the HSM during donning and minimizes pistoning when suspension is required. 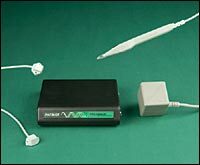 A release button allows for easy removal of the prosthesis. 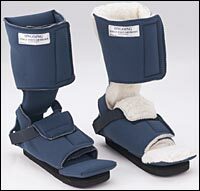 The Iceross Seal-In Liner comes in two duromoters and offers the advantages of freeing knee motion and increased comfort. Universal “Gunslinger” Auxiliary Belt—Knit-Rite Shoots From the Hip! A new version of the PowerBelt Auxiliary Suspension Belt" is now available from Knit-Rite Inc., PowerBelt line distributor. This universal design includes two openings, allowing for left or right applications. The "Gunslinger" provides a more oblique option for wearers who prefer that style. 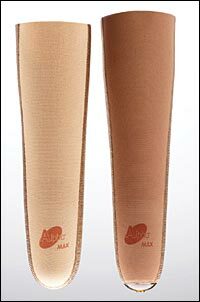 The high-denier Lycra spandex PowerBelt material "squeezes" the prosthesis to the body, stabilizing the socket on the residual limb. 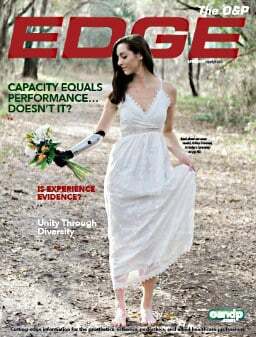 Knit-Rite has received consistent feedback that even amputees who've not previously worn belts enjoy improved body integration and control with their prostheses. PowerBelts are thin, durable, and comfortable. PEL Supply proudly presents a new line of machined modular aerospace-grade titanium lower-limb components for patients up to 350 lbs. 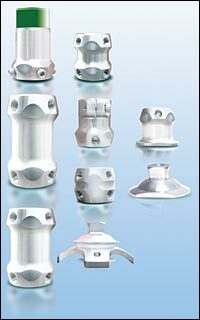 Manufactured by Seattle Systems and designed to minimize product weight, included are: pyramid, female and vertical height adaptors (Staats), 30-mm clamps and four-prong adaptors. Carbon fiber pylons are also offered at the newly rated 350-lb limit. According to Seattle Systems' Dave Hensley, CP, FAAOP, these strong, lightweight Ti components go a long way to help heavier patients achieve their highest possible activity level. PEL Supply offers a generous discount/rebate program stocking over 35,000 products with most available for next- day delivery.